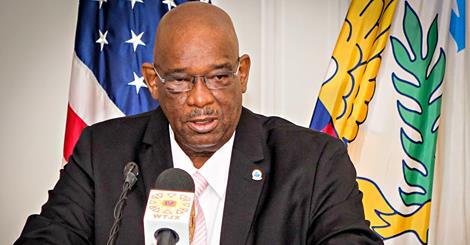 Police Commissioner Delroy Richards Sr.
CHRISTIANSTED – A Sunny Isle-area business was held up in a daring broad daylight armed robbery Monday afternoon, according to the Virgin Islands Police Department. The 911 Emergency Call Center dispatched police at 12:41 p.m. Monday to investigate the report of a robbery incident at Caribbean Lock and Safe located in Estate Diamond Ruby. Responding police arrived at the business and met with the three individuals who were present at the time of the robbery; the owners (husband and wife) and a male employee. According to the male employee, it was roughly 12:30 p.m. when he was leaving the business and saw an unknown male enter the screen door located on the building’s eastern side, brandishing a gun. The suspect demanded that he get down on the ground and as he complied the suspect took his wallet, emptied it of all the cash it contained and handed the wallet back to the employee as he turned towards the rear of the businss office. The female co-owner of the business had secreted herself in the restroom with the door slightly ajar and the suspect discovered her, pointed his gun at her as he had her too, lay on the ground. She stated that she was able to see the suspect pick up a bank bag that contained cash and he then went to the cash register at the front of the business, emptied it of its contents and then left the business. 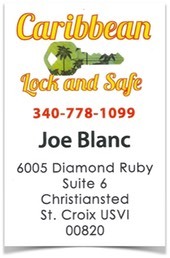 The male co-owner of Caribbean Lock and Safe stated that he been in the far rear of the business and saw when the suspect left. He then ran outside and phoned 911. No one was injured in the robbery and an undetermined amount of cash was taken. The victims described the suspect as having worn all black clothing, a black bandana covering his face and holding chrome-colored gun.